Start Menu, the one button that you pressed or clicked in Windows operating system in order to get access to other All Programs sub-menus, or Control Panel and other shortcuts. In Windows Vista, the Start menu has been completely revamped, by taking away the word of Start, and replacing the icon with newly designed and intuitive Windows vista Orb logo. Beside, the design of Start menu interface has became more attractive with lots of new features such as Start search bar, listing of programs as icons, and get rid of inconvenient scrolling and cascading when there is long list of programs. For Windows XP users, it’s possible add and put the Windows Vista-style Start menu on the XP desktop too, with the help of VSE. Vista Start Menu Emulator (VSE) is a program that transform and emulate the Windows Vista start menu on Windows XP operating system. 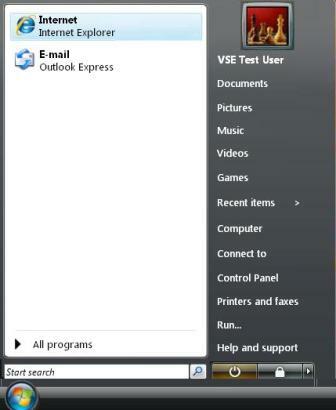 With VSE, a Windows Vista Start button-like icon will be placed on the desktop, which can be placed anywhere. It’s best to place this Vista start button on top of Windows XP Start menu to cover and hide it, although the VSE start button won’t replace the original XP start menu. But this gives you ability to have 2 start menus, if you put the VSE start button on different location than of default start menu. The Vista Start menu Emulator’s Start button has similar looks and feel and user interfaces with the start menu in Windows Vista, plus some standard features. VSE requires Microsoft .Net Framework 2.0 in order to work properly. Download Vista Start menu Emulator (resource no longer available) and installation instruction and solution to common problems faced such as emulated start button disappear behind the windows xp start button, how to set up list of installed programs, how to put extra shortcuts and etc are available at vseproject.extra.hu/sup.ht (no longer available).